Mohamed MorsyFollowing a symposium in London organized by the Egyptian Community in the United Kingdom, a diaspora association of Egyptian Muslims in Britain, Arabist reader Dalia Malek had the chance to follow up with Muslim Brotherhood Guidance Council member and president of Justice and Freedom Party Mohamed Morsy and ask further questions about his lecture. She sent in this transcript of the interview and her notes on Morsy's lecture. As Egypt heads toward parliamentary elections in September, the Muslim Brotherhood is spreading the word about its new party’s ideology. Justice and Freeom portray itself as working within an Islamic framework that is open to Egypt’s religious diversity, emphasizing its compatibility with religious minorities, women’s rights, and human rights. The Muslim Brotherhood’s legislative body has delegated Mohamed Morsy to be the President of its Freedom and Justice Party, whose ambiguous distinction from the Muslim Brotherhood has been debated. 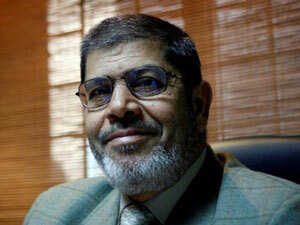 Morsy is also the media spokesman and member of the Guidance Bureau. In the lecture, Morsy repeated the Brotherhood’s claim that the party does not seek to promote a presidential candidate for the upcoming election and that it aims to gain no more than 50% of seats in Parliament. Surprisingly, and in contrast with the recent claim that the Muslim Brotherhood and Salafists have unified, Morsy stated that the party and the Salafists are distinct, noting the Salafists’ lack of political experience, and that he disagrees with the majority of their views. He referenced a Salafist leaflet that used the word “infidels” four times, depicting use of this language in a negative light. Dalia Malek (DM): You mentioned in the lecture that an Islamic state that applies Islam properly does not currently exist. But we have seen other countries that purport to have Islamic governments implement un-Islamic ideologies and have poor human rights records. In addition to the diversity of religions in Egypt, even Muslims in Egypt cannot agree. Why do you think that this will work in Egypt? Mohamed Morsy (MM): I was saying that in general, there is no such religious state based on a theocratic concept. There is no state in the world now that applies the meaning of “theocratic state.” What we have now is the civic state. Whether it does or does not have the flavor of religion is something else. We cannot in reality call Muslim countries “Islamic states.” As you said, we see violations of the constitutions of those countries. But an Islamic state is by definition a modern state. It’s a civic state. You have three completely independent authorities: the parliament, the judges, and the government. Islam confirms these authorities to be independent. Also, the people are the source of power. This is also by definition Islamic. When people have accepted the notion of Islam as a framework, violations within it will be minimized. It cannot be imposed on the people and it cannot be done from the top. It has to be initiated, created, and agreed upon by the people. Egyptians have been trying to vote in elections, and they have been prevented. We have been working with people to accept the Islamic framework. That’s why we are expecting and hoping that what will happen in Egypt will really represent the people, and the Islamic framework can to a great extent control the government and the behavior of the State in the future. This requires will and that the people remain alert, know what they are doing, and follow what is going on in the government now. This is happening now; after the revolution, people will mobilize and go against anyone who tries to drag them back toward dictatorship. DM: What would you say to those who disagree with the Islamic framework? MM: People are free, even to believe in God or not. People are free to express themselves and to have their own opinions and positions, as long as they are not committing crimes against others or going against the law. That’s why I said in the discussion that the will of the people is the source of power; when it is respected, the top will behave accordingly. When you have opposition, they have the right to raise their voices about whatever they want as long as they are not against the law or the people’s will, which is reflected in the constitution. But they should be free to express themselves as opposition blocs, or even as individuals. DM: You said in the lecture that your political party should not and will not seek to change the constitution to suit its interests. The Egyptian constitution already stipulates that Islamic sharia law is the primary source of legislation. By not changing this part of the constitution, your party is in effect already at an advantage. How would you respond to those who think that this should be changed to suit a wider population? MM: There is a difference between the party’s statements and the party’s regime, let’s be clear. The Constitution represents the people, and the party is represented by its members. We will not impose what we believe on people. We cannot change the people’s will. We agree on sharia and we want it to remain. This statement does not contradict the people’s rights, equal rights, or human rights. This is stated in Article 5 of the Constitution, and articles 2, 3 and 5 all work together. There is no contradiction there. If the new constitution comes within this framework, it will guarantee everyone his right to practice whatever he wants within the framework of the law. We support this article, but it’s not only our will that will keep this article in the Constitution. It cannot be kept or changed unless the majority of the people want this. We don’t have 100% agreement on what is being voted on. The feeling among the people now is that they are capable of expressing themselves and ensuring that they live with equal rights. I think that if it continues like this and is really applied in practice, it will guarantee a sort of balance in society. DM: What do you think about Egypt’s current recognition of only three religions, or the fact that there is a “religion” category on the Egyptian national ID card? MM: I think that this notion has been raised many times and we have said clear things about it. We respect the court’s statements regardless of the end result. If a person who is in his right goes to a court and gets a statement that is to his benefit, then that’s okay. We agree with anything that is issued from the court. Of course the court takes the overall final decision. If people go to the court and a decision is issued, then we have to respect that.